Like John Dillinger. Only 80 years later. Although it didn’t look at all dated, Chrysler has still given its 300 full-size sedan a minor facelift for 2015. Having its official debut at the LA Motor Show, the updated 300 lineup features a revised front fascia partially inspired by the 200 sedan, restyled headlights, and new wheel designs. LED rear taillights are also new. The interior has been improved with higher quality materials, a standard 7-inch display screen, as well as an 8.4-inch touchscreen display as part of the Uconnect infotainment system. WiFi on demand is also available and the steering wheel has been redesigned. The engine lineup remains untouched: a 3.6-liter Pentastar V6 delivers 292 horsepower and 260 lb-ft of torque, while upgrade to the 300S and that output is increased to 300 hp and 264 lb-ft. And, of course, there’s the 00C and its familiar 5.7-liter Hemi V8 with 363 hp and 394 lb-ft. An eight-speed automatic gearbox is finally standard for all engine options, and buyers of V6 models have optional all-wheel-drive. Sadly, the 300 SRT8 has been discontinued. 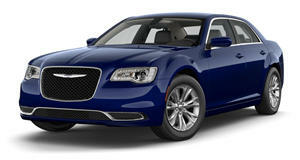 Prices will start at $32,390 while the top-end 300C Platinum will set you back a cool $43,390.